Protect Your Child Today, Tomorrow, and Beyond: 5 Estate Planning Steps for Parents of Children with Special Needs - Lewis Kannegieter Law, Ltd.
Every parent wonders, “What will happen to my child when I am gone?” “Who will take care of my child if I can’t?” and “How will my child be provided for financially in my absence?” For parents of children with special needs these worries are magnified. If your child has physical or developmental disabilities, there are many legal and financial concerns that must be considered for the future. If something unexpected happened to you who will take care of your child? Is that person equipped to handle your child’s unique needs? Will your child be independent once he or she turns 18? How can you continue to make medical or financial decisions on your child’s behalf? Will you need to seek guardianship over your adult child? How can you provide enough money for your child throughout his or her lifetime? How can you make sure your child is not taken advantage of financially or emotionally? Taking the time now to get the proper plan in place could make a world of difference for your child. I have written this e-book to provide an introduction to the key estate planning issues facing parents of children with special needs. This e-book is perfect for busy parents who want to know how and where to get started and will answer some of your most burning questions. 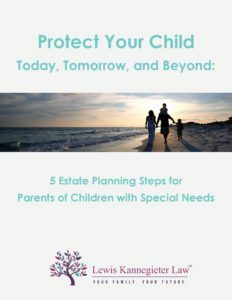 Request your FREE copy of Protect Your Child Today, Tomorrow, and Beyond: 5 Estate Planning Steps for Parents of Children with Special Needs today! Please send me a free copy of this report. Please also subscribe me to your Family Matters Newsletter. I understand that no attorney/client relationship is being formed by requesting this report.